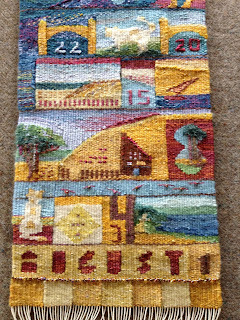 I took the August Tapestry Diary off the loom the other day and here is a picture right after I cut it off. 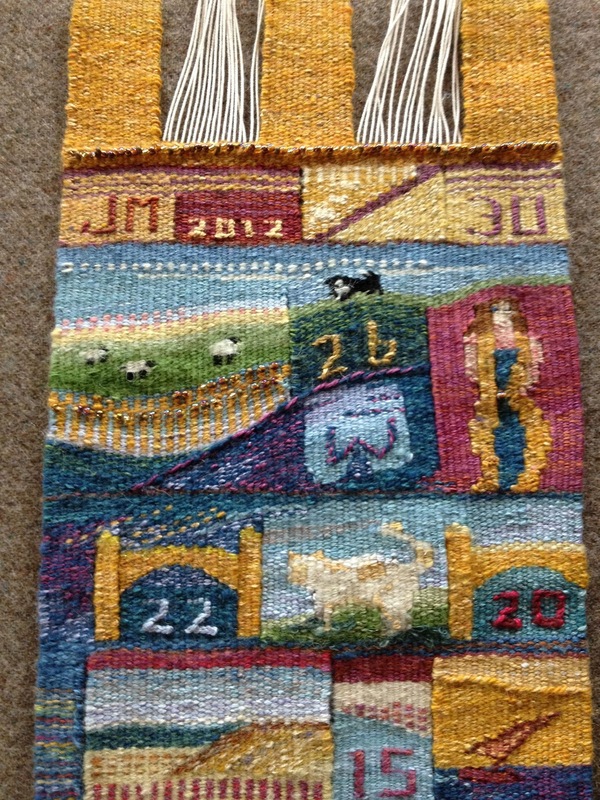 I worked some on the finishing yesterday and will put up some more photographs once it is complete. I particularly enjoyed working with silk this past month, and I did add a few beads in this one. I found myself doing little scenes in August quite often and some of these were more what I was thinking about than reality. 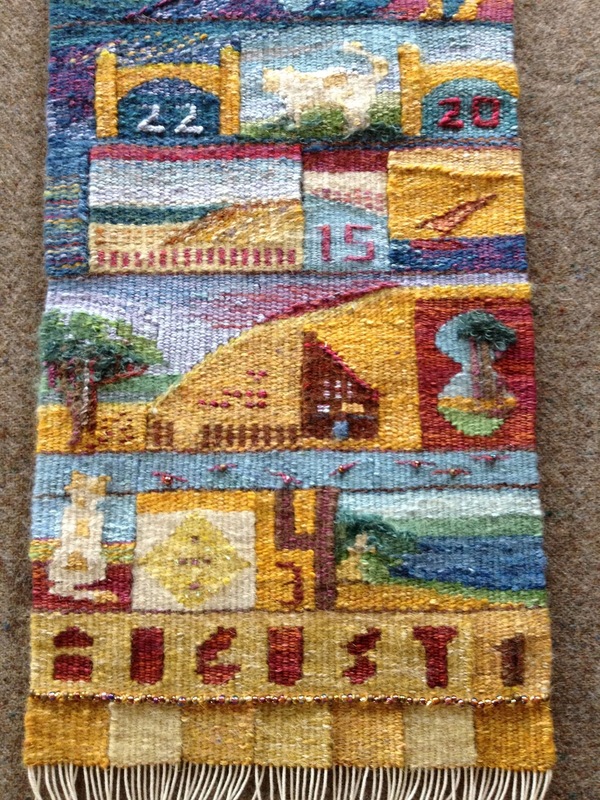 There were no trips to the ocean in August but I did weave about it! There is a detail of the top after cutting off and another of the bottom half. Hopefully there will be better pictures after the finishing. Septembers effort has already begun. I decided to warp a 16 inch Mirrix with the warp extenders attached so that I have about two yards of warp to work with. The plan is to weave the diary for the rest of the year on this warp at 10 ends per inch and 10.5 inches wide. I think this will be more efficient for the busy months ahead as I will not be finishing and warping every month. I haven't completely decided about the new diary but I know I am going to be using more linen in the new one in addition to wool and probably still a little silk. I want to concentrate on adding more linen this month and to keeping generally to a smaller space for the days. I want to simplify a bit so that some other projects can see some progress. Here is a picture of the 16 inch Mirrix with the extenders during the warping process. 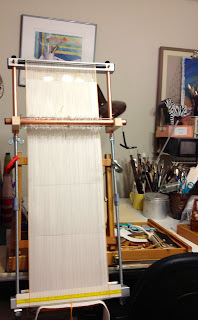 I am using 12/6 cotton seine this time. 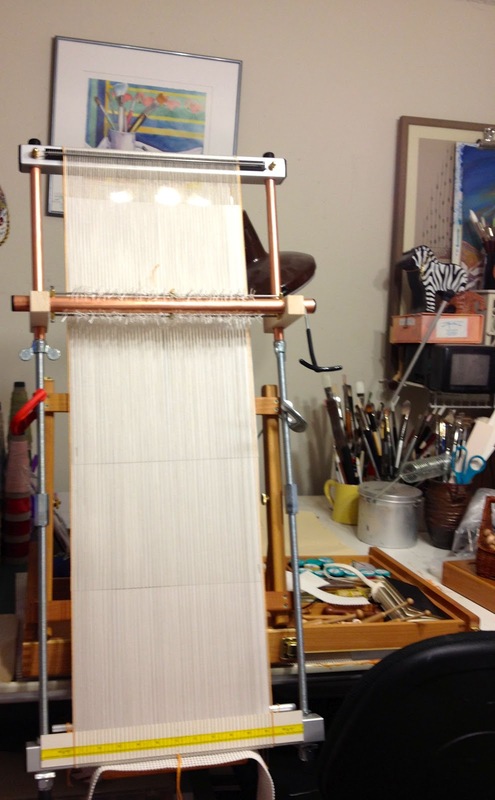 Here is the finished warp moved into the studio. 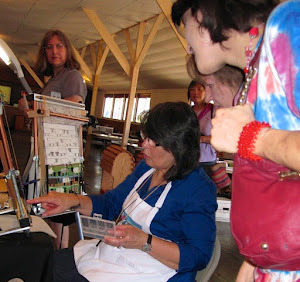 I have it clamped to my easel and sitting on the drafting table so that I have flexible height adjustments for working. 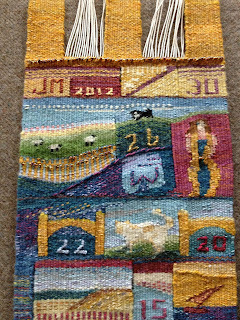 Work on the weaving of September has begun!